Pace is everything on long runs and treadmill marathon training is one way to help develop and perfect your strategy of running your best time in the next race. If you’ve never run a marathon before you are probably wondering if it is even possible to train effectively on a treadmill. If you have a solid machine that can handle continual long, hard runs of 10K, half marathons, and full marathons, then the answer is – yes! In fact, world class athletes such as Ingrid Kristianson of Norway, who trained all winter indoors on a treadmill, have achieved record-breaking results. If road training is not an option due to weather, hilly terrain where you live, or you just don’t want to deal with the honks, use your treadmill to work on pace, endurance, and conditioning. The machine is able, but are you motivated to do it? To combat boredom on an indoor treadmill you have a couple of options including watching TV, or perhaps getting a machine with wireless technology such as iFit to download Google Maps that display “virtual” road running on the screen. Yet you should also consider that treadmill marathon training is also helpful for mental preparation, i.e., getting in the zone and working on pace and stride turnover to the exclusion of all distractions. The speed and endurance you need for your big day are two key points you’ll work on during long runs on the treadmill. Since you don’t want to run significantly slower during the second half of a long race than you did the first half, you’ll want to work on a pacing strategy. Most quality treadmills have pre-set training programs for full and half marathons. These will adjust the incline from 1% to 3% at different points to simulate hill climbs, as well as allow you to set your pace during segments as you continue to improve your times. If you have a couple of marathons already under your belt, you likely have developed a pacing strategy and know your split times. Keep in mind that whatever style of running you do out on the road can be done on a treadmill. Many runners find that running indoors help save their legs and feet from the hard pounding their body gets from street pavement. 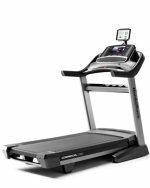 A treadmill’s cushioned deck and shock absorption system will help alleviate stress on the body, and let you focus more on pacing and aerobic endurance. Of course, during your final weeks of preparation, you should also do a few runs outdoors to prepare your legs for the shock of the harder surface. Treadmill marathon training is most effective if the machine can give you challenging endurance workouts, but also check that the machine is properly calibrated to monitor your speed runs accurately. Treadmill runs are ideal for marathoners, but be aware of the differences of surface, lack of wind resistance, and other factors, so that your indoor training sessions can best compliment your race strategy.